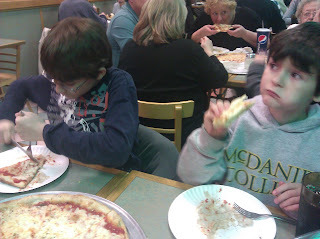 I went to Lenny's Deli at Owings Mills for dinner one night with my mom, Owen, and Olivia. When we got there, it was very near to another place I've reviewed, Sofi's Crepes. When I got there, it looked like it was very plain on decoration, but they did have a TV for entertainment. When I sat at my seat, I looked up at the big menu board they have. It had things on it like the Egg Special for breakfast since they serve breakfast all day, the Turkey Breast Sandwich, and the Chicken BBQ. They also had a Kid's Menu, which consisted of items like the Grilled Cheese and Hot Dog. I was going to get the Pancake Special, but my mom insisted on me getting there Corned Beef Sandwich, since they're famous for their Corned Beef. I also had some American Cheese on it, too. My brother got the Hot Dog, my sister the Grilled Cheese, and my Mom the Potato Latkes. It took a really long time for our food to come out, and I was starved when it got there. But, my Corned Beef was delicious! It tasted like what my dad makes, which is also delicious. (You can find out more about how my dad's cooking in my Chicken Corn Quesadilla With Cumin Cream post) After I ate, we looked at the pastries they had. If I would've gotten dessert there, I would ever have their cookies or the Frozen Yogurt. I give *** stars for kid friendly and **** stars for food. Well, that's all. Bye! I went to Mamma Lucia's, which is close to my house, on Friday night for dinner. When we got there, there were many people. It took a while to get a seat, and took even longer to order. Though I was entertained by the TV's they have. We had decided to get a Large Cheese Pizza, but we could've gotten other pizza's like the Meat Lovers Pizza, The White Pizza, or, even better, the Broccoli White Pizza. They also had a kid's menu, which had things like Macaroni & Cheese, Spaghetti & Meatballs, and a Slice Of Cheese Pizza. They also had other things like Baked Ziti, Shrimp Scampi, and Chicken Baltimore. After my mom ordered, we got our drinks. Then I realized they didn't have kid's sized cups. Actually, they only had one size, which was medium. It took a long time for our food, but I feasted on Mozzarella Sticks, which you have to order. They were fantastic! They were cheesy, and the bread was baked perfectly. The only problem, though, was that there weren't that many and they were small. When our food came, it looked delicious! Though, since it was steaming hot, we had to wait a few more minutes before we could take a bite out of it. Though when I did, I thought it was terrific! It was cheesy, though the cheese did fall off the pizza. I loved it! I give ***1/2 stars for kid friendly and ****1/2 stars for food. Well, that's all. Bye! Guess what? I went to Jason's Deli with Richard Gorelick, the food writer for The Baltimore Sun, in Timonium, Maryland! We went there since it was said to be a very kid friendly place by Parent's Magazine. When I got there, and after I sat down, I immediately searched for a kids menu, which there was. There were a lot of things on the kids menu. Some of the choices were Cheese Pizza, a Turkey & Cheese sandwich, and a Kid's Baked Potato. Though instead of getting something off of the kids menu, I decided to get a meataballa sub as a half slim and a bowl of broccoli and cheese soup off the regular menu. Even though they had a lot of choices on the kids menu, none of them surprised me. Plus, even though they said that it is a deli, there weren't very many sandwiches on the kids menu. Some of the choices on the regular menu were salads, sandwiches, subs, pasta, and paninis and wraps. They also had soups like Tomato Basil, Organic Vegetable, and a Soup Of The Day for every day of the week. My brother got buttered bow tie noodles, even though it wasn't technically on the kids menu and my sister got a PB&J from the kids menu. Richard got a Reuben THE Great, my mom got a chicken salad wrap sandwich, and my dad got a special sandwich. After we ordered, we got our drinks and sat down. About five minutes later, our food came, which was really quick. My meataballa sub was okay, but wasn't the best sub I've ever had. There was a lot of bread and the meataballs were falling out of the meataballa sub. The broccoli and cheese soup was the best I ever had! It was really cheesey, and there was a lot of broccoli in there too, which can help keep a healthy diet. After dinner we got dessert. There were desserts like cookies, dessert bars, brownies, and strawberry shortcake. But I decided to get the free ice cream bar, which is in Jason's Deli. On some desserts you can even get the ice cream on the dessert. The ice cream was really great, but the sad thing was that it had only three flavors, chocolate, vanilla, and swirl. You also had 2 choices, a cup or a cone. I got a swirl in a cone. It was delicious! It was really creamy and cold, plus it had the right amount of chocolate and vanilla. Before I left, I saw that they had lollipops and mints in bowls on the way out, though I didn't take one. I give **** stars for food and **** stars for kid friendly. The reason why I think 4 stars for kid friendly is because even though they're fast, there's no entertainment around. As far as being the best restaurant in America, I think they could do better by putting more deli sandwiches on the kids menu. And thanks Richard Gorelick for coming with me to Jason's Deli! Well, that's all. Bye!